India to add more internet users than any country in 3 years: Report from McKinsey. According to a report titled ‘Online and Upcoming: The Internet’s impact on India’, by McKinsey, India will add more internet users than any country in the world over the next three years, as average penetration rises from 10% today to 28%. Read More Here. California law distinction between Independent Contractor and Employee. Important distinctions for any California Employer. Inventus Law Client, IdealSeat’s, 30 Stadiums, 30 Days virtual baseball stadium tour is up and running. IdealSeat’s 30 Stadiums, 30 Days virtual baseball stadium tour is up and running. From IdealSeat: “We have just launched an Indiegogo campaign and would love to have you join the team. Please see more details below and other ways to connect. As always feedback and ideas are appreciated. 2) Like our Facebook page and get the latest info on technology and baseball. 3) Check us out on twitter and explore 30 Stadiums, 30 Days. Thanks again for your support and looking forward to the 2013 season! 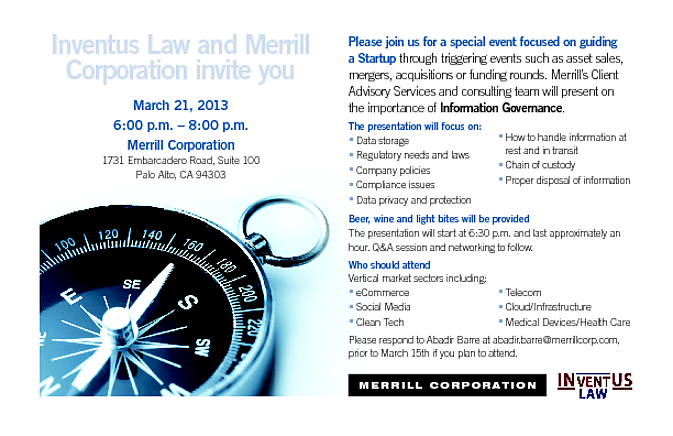 Please Join Us for a Special Presentation Regarding Information Governance for Startups!